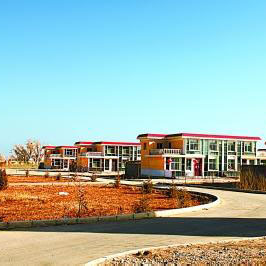 From 2013, Gansu province will gradually promote a “south wall plan” in village buildings to save energy. “South wall plan” means installing a sunshine room and a warm corridor on the south façade of the building, equipped with solar energy appliances to improve occupant comfort and decrease fossil energy consumption. Gansu is one of the most solar-resource-rich areas of the country, enjoying a clear advantage with the use of solar technology. The government expects to solve or partially solve living needs such as housing heating, hot water supply and house-use electricity. Gansu will take the “village” as the basic unit of effective organization and implementation of the plan. At the early stage, some villages will be selected as pilot projects. The plan will be implemented in newly-built houses with the adoption of energy saving technology such as solar hot water technology and photovoltaic technology in step with design, construction, and acceptance of the house. At the same time, the government will also actively explore local energy-saving products, technology, and continuously enrich the "southern wall project".